The Tennant T20 is the most rugged LP ride on industrial floor scrubber-sweeper available in the industry today. Customers who are looking for a propane scrubber-sweeper with maximum productivity, along with simple operation and maintenance procedures, choose the T20. These attributes, along with some of the lowest operational costs of any large scrubber sweeper in the industry, make it the choice for cleaning professionals and most national rental companies. Tennant’s unique design of the T20 makes this large ride on propane unit extremely maneuverable and very safe to operate. The operator is seated toward the front of the unit making it easy to see obstacles and other traffic in your facility. Front wheel drive and front wheel steering makes training on the T20 simple, even for novice operators. This scrubber-sweeper is capable of scrubbing into tight corners and close to walls. The entire machine is surrounded by heavy steel bumpers and large non marking rollers on the corners to prevent damage to your equipment and facility. Maximum productivity is the biggest reason to consider the Tennant T20. This LP scrubber is capable of scrubbing and sweeping 60,000 square feet per hour. Large 80 gallon tanks along with the available EcH2o system gives users the longest scrubbing time in the industry between fills. The simple cylindrical cleaning system makes this machine a breeze to clean up after use. The T20 is available in two choices, disk main brushes or cylindrical main brushes. The cylindrical brushes have the ability to sweep and scrub. On-board diagnostics give you quick, easy maintenance and the T20 also features no-tool squeegee and brush change to keep your operators on the go. All of this along with the best reliability available in the industry today means that your operators will spend more time scrubbing. 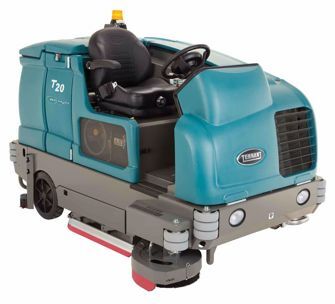 Propane/LP ride on scrubbers, like the Tennant T20, are the most popular models in the floor cleaning industry. LP equipment is extremely popular in facilities where forklifts are found. Since many forklifts are fueled by propane, it’s convenient to also have a propane powered sweeper scrubber. Even more, when well maintained, propane/LP scrubber engines can run as much as ten thousand hours. It’s simple to refill or replace a propane tank, they’re extremely efficient with zero down time compared to battery-operated counter-parts. They're also have more sustained power on graded surfaces, which is typically why they’re recommended in parking garages.